The Captive-Bred Pink Skunk Clownfish, also known as the Pink Skunk Anemonefish or False Skunk-striped Anemonefish, has a peach-orange base colour with one white stripe behind the head that runs from the nose and down the entire length of the back. Another contrasting white stripe is located just behind the eyes. Captive-bred fish have a unique advantage over wild-harvested species, as they are generally very hardy and more accustomed to conditions found in the home aquarium. 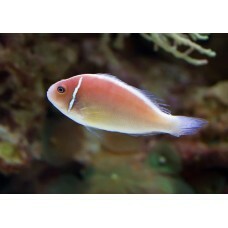 Therefore, captive-bred fishes make a great choice for novices and seasoned aquarists alike. The recommended water temperature when keeping Black Tomato Clownfish is 72-80° F (22-27° C), the pH-value should be kept in the 8.1-8.4 interval, and the specific gravity should be 1.020-1.025. A carbonate hardness of 8 - 12° dKH is ideal.